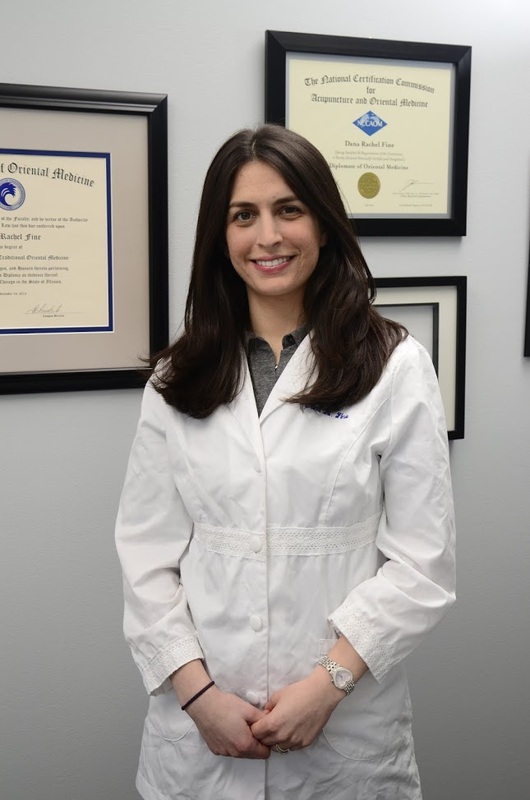 Dr. Dana Fine is a licensed acupuncturist in the state of Illinois and certified as a Diplomate of Acupuncture by the National Certification Commission for Acupuncture and Oriental Medicine (NCCAOM). She is the owner of Dana Fine Acupuncture, LLC in Glenview, IL. She graduated with honors from Pacific College of Oriental Medicine (PCOM) in Chicago with a Doctorate in Acupuncture and Chinese Medicine. Dana treats various issues such as; headaches, musculoskeletal issues, psycho-emotional issues, and insomnia, as well as many other health concerns. Through the Pacific Center for Lifelong Learning Dana has studied the connection between Chinese Medicine and Functional Medicine. She uses both principals in her practice. Prior to working in the health industry, Dana graduated from The Ohio State University with a bachelor’s degree in Journalism. She worked for The Score Radio, LiteFM, The Women’s Sports Foundation, and Nike Women as a journalist. While working for Nike Women, Dana researched stories about health and wrote an article about Tai Chi. After writing the piece on Tai Chi, became more fascinated with Traditional Chinese Medicine. Later after breaking her foot, Dana healed her injury with acupuncture and herbs with the help of her father, a medical doctor and acupuncturist. This life changing experience led Dana to attend Pacific College of Oriental Medicine. Dana was able to combine her two careers by publishing many articles for the magazine Try Acupuncture. She also published a book entitled Kosher Chinese Medicine, which connects Chinese Medicine to Judaism. Dana lives a very active life with her husband, daughter, and doggie! Together, they run and play tennis, basketball, or any sport they can, depending on the Chicago weather. She is an avid Chicago sports fan and believes that her unforgettable childhood came from being a Bulls fan in the 90s. Article about Dana Fine and Dana Fine Acupuncture, LLC in the Northbrook Tower! Check out this YouTube video about the education involved in becoming an acupuncturist.